Life in a dismal bureaucratic cul-de-sac is not what the irreverent, high-flying Robert Amiss expects when the British civil service lends him for a year to the British Conservation Corporation. In theory, he is to gain invaluable experience of thrusting capitalism: in practice, he is condemned to a non-job in a backwater managing disgruntled and demoralized time-servers who deeply resent this interloper. Morale in this all-male environment is not improved by the arrival of Melissa, a radical feminist lesbian separatist. It is only Amiss’s sense of humour and the joys of visiting Rachel, his new love, in Paris, that keep him sane. The malice, envy and anger that burgeons among the filing cabinets is first expressed in pettiness and then in unpleasant practical jokes. These begin to escalate worryingly and finally culminate in callous murder by means of boxes of poisoned chocolates sent to the bureaucrats’ wives. Did they come from Henry Crump, the dirty old man? Or Tony Farson, the miser? Or Graham Illingworth, the depressed home improver? Or one of the other sad, disappointed men? Or even from Melissa? With the help of Ellis Pooley, the young detective obsessed with fictional sleuths who makes his debut here, Amiss and his friend Superintendent Milton try to assess motives in an office where marital discord and broken dreams might drive anyone to murder. 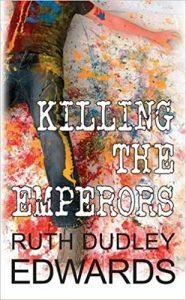 This is the second in Ruth Dudley Edwards’s witty, iconoclastic but warm-hearted satires about the British Establishment. Published by Poisoned Pen Press. 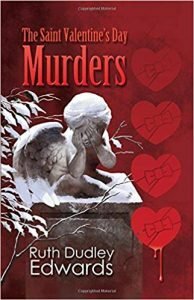 The Saint Valentine’s Day Murders is a witty, well-written mystery as well as a keenly observed and cynically funny view of modern bureaucracy and the people who work in it.